This year's Forum is being held at the The Fairmont Queen Elizabeth in Montreal, Quebec. NAEM has secured deeply discounted room rates at the Fairmont, which is situated in heart of downtown Montreal. NAEM has also secured discounted rooms at a nearby alternate hotel, the Novotel Montreal. For those coming from the U.S.: To facilitate your entry into Canada, you can download our letter from the Canadian Border Services Agency which recognizes our conference. Call the Fairmont at (800) 257-7544 and ask for the ‘NAEM’ rate. Passport Required to Enter and Exit Canada: A valid U.S. passport, passport card, or NEXUS card is required for U.S. citizens entering Canada. You may apply for a US passport through the State Department. If you need to renew your US passport you can do so through the US State Department as well. For temporary visits to Canada for less than 180 days, a visa is not required for U.S. citizens. If a U.S. citizen traveling to Canada does not have a passport, passport card, or approved alternate document such as a NEXUS card, they must show a government-issued photo ID (e.g. Driver's License) and proof of U.S. citizenship such as a U.S. birth certificate, naturalization certificate, or expired U.S. passport. Visit the US State Department Website for full details on passport and travel requirements. Originally called Ville-Marie, Montreal was named after Mount Royal, the triple-peaked hill located in the heart of the city. 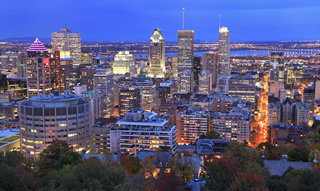 Montreal was recently named a UNESCO City of Design and is an important centre of commerce, aerospace, finance, pharmaceuticals, technology, design, culture, tourism, film and world affairs. The official language is French. The closest airport to Fairmont The Queen Elizabeth is Montréal-Pierre Elliott Trudeau International Airport (YUL). Pierre Elliott Trudeau International Airport (domestic and international flights) is located 14 miles (22 km) from the hotel. Transfers to Pierre Elliott Trudeau Airport: starting at $75 one way. There is a flat rate of $40 CAD to downtown hotels. Arrangements for a limousine transfer can be made with the hotel concierge upon request. A taxi generally takes around 25 minutes to get from the airport to downtown Montreal. Getting to the hotel by public transit costs $9 for an unlimited ticket you can use for both bus and metro rides over a 24-hour period. You can take the 747 bus from the airport directly to the hotel, without having to transfer to a subway line. Take it to the Bonaventure Station, and you will be right in the vicinity of the hotel. You can buy tickets for the 747 bus for $9 at the airport. Here is a neighborhood mapthat shows where the bus stops. The bus runs 24 hours a day, 7 days a week and will take between 35-45 minutes depending on traffic conditions. Unless the city is blessed with a rare Indian summer extending beyond September, Montreal is in full fall mode come October. Crisp, cool but fairly comfortable, it's not uncommon to experience a snowfall at this time. But chances are it's a light one where flakes don't stay put on the ground for more than a few minutes or hours, melting away by day's end. Precipitation: anticipate 6 days of rain in October and 13 days involving light showers. One day of snow flurries a possibility. For comfort's sake, October in Montreal is all about layers, particularly if out and about from day to night. Indian summer days are a possibility and an afternoon in the sun can be comfortable with only a shirt and blazer or windbreaker but a light jacket with scarf may be necessary when temperatures dip below 10ºC (50ºF), usually by sundown. For more details, contact Mike Mahanna, NAEM Program Director, at mike@naem.org or call (202) 986-6616.